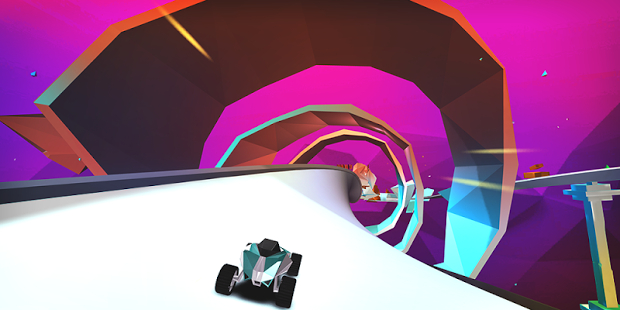 Stunt Rush is an arcade racing game that combines the intense survival action with the exploration of an atmospheric world. Your garage consists of blazing fast buggy cars that allow you to boost, steer in air, jump off the ramps and even rewind time backwards! • Rewind time backwards and make that jump again! • No ads! Enjoy the racing gameplay without any distractions. • Not pay-to-win game. Your purchases are kind donations, you don’t have to buy anything! So go pick a buggy from your garage that suits you best and drive the fast tracks in the unexplored world of rocks and debris in this fast-paced racing game! Play more awesome games at http://playhub.com! Now every buggy has it's own stats! We also improved controls and fixed some bugs.